Every other year, insurance covers a new pair of glasses. 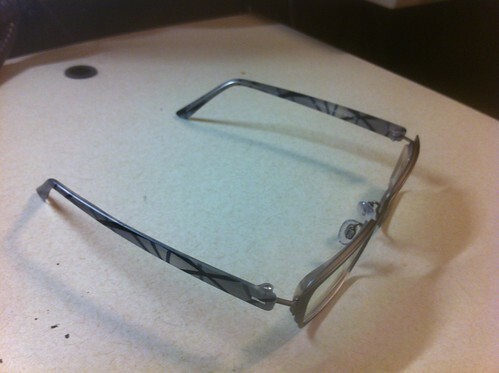 By then, my old glasses have usually got scuffs or some such, so it’s good timing. I always go in thinking I want something not too boring, maybe plastic with nose pads. Plastic so my thick lenses aren’t too obvious, and I always want nose pads, they’re better on my nose and face somehow. But I never end up with plastic. It’s hard to find nice looking (on my face) glasses that are plastic and with nose pad. Usually plastic glasses don’t have nose pads, so the number of choices is smaller anyway. I’ve started choosing my frames based on country of origin. Basically anything not made in China. It’s hard, but they’re out there (Japan, France, Italy). Of course, I also look at style, which seem to be similar time after time. I think we all fall into a preference and comfort level with particular styles.